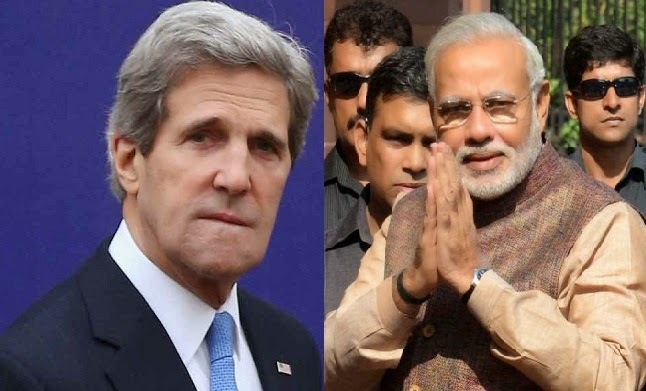 US Secretary of State John Kerry did not openly acknowledge it in pubic but he took Modi to the woodshed with "hard evidence" of India's continuing support of the Tehrik-e-Taliban Pakistan (TTP) and its chief Mullah Fazlullah currently sheltered in Afghanistan. The US has since put Mullah Fazlullah on its most wanted terrorist list. A report in Daily Mail News filed by Christina Palmer and Anjali Sharma quotes an unnamed inside source as saying: “The atmosphere in the room after Kerry and Modi had lunch together, changed when Premier Modi very blatantly stated that he and his government so shocked to hear about the Peshawar School Terror that the schools and both the houses of the Parliament observed moment of silence to mourn the Peshawar School Terror and thus there could be no Indian hand involved in it.” In response, the sources say, Americans "got furious and showed some hard evidences of Mulla Fazalulla and RAW nexus in Afghanistan to influx terror in Pakistan. The American side took the Indian side quite aggressively and also snubbed Modi over the highly objectionable role of his National Security Advisor Ajit Kumar Doval ". The reports adds: "Modi and his team were grilled over the admissions of Ajit Doval of funding and utilizing TTP terrorists to destabilize Pakistan and Modi was asked to tame Doval and Research and Analysis Wing (RAW) both in this direction. Modi was told to end India’s patronization of Mulla Fazalulla in Afghanistan and it was made it clear to Modi and his team that the US was about to place Mulla Fazalulla on list of global terrorists and an Indian pampering of him would jeopardize the US-India relations and can also have its implications on the upcoming visit of the US President to India". Paris Massacre; Kerry-Modi Meeting; TTP's Fazlullah on US Terror List; Anti-Imran Protest from WBT TV on Vimeo. Riaz the Daily Mail site where this appeared is not THE Daily Mail, it's a knock off site. I grew suspicious due to the poor grammar / writing style of the article. I don't think the reporting is credible. Please check. Monis: "Riaz the Daily Mail site where this appeared is not THE Daily Mail, it's a knock off site. I grew suspicious due to the poor grammar / writing style of the article. I don't think the reporting is credible. Please check"
Zia:" But so what - there is so much to sell to and buy from each other. It boils down to dollars rupees and self interest. And there is plenty of that between the two countries"
I believe US concerns with the re-emergence of international terror from Afghanistan trump other concerns about economy and trade. Homeland security is top priority for US leadership. I agree Riaz. But fake news stories seriously undermine the point you are making. I don't think you should use that article as a source. Everything becomes suspect. Monis: "I agree Riaz. But fake news stories seriously undermine the point you are making. I don't think you should use that article as a source. Everything becomes suspect." Would you prefer a well-written NY Times propaganda piece such as those created by Judith Miller on Iraq's non-existent WMDs? I know about Balochistan, as also Indian in an Indian think tank article;but I thought this was just Karzai as an article had previously mentioned. But I guess he had a helping hand. When India loses half of country it can start whining. "The surreptitious visit of Sheikh Mujib to Agartala on a Top Secret mission to meet Indian co-conspirators on 5 February, 1962 is corroborated by a diary note endorsed by Khowai SDO Smarajit Chakravarty: “Today at about 1300 hrs one Mr. Mujibur Rahaman, Amir Hussain & T Choudhury arrived through Asharambari. They have been sent to Teliamura under instructionfrom D.M”. This essential piece of evidence, the missing link in the Agartala Conspiracy case has belatedly been provided by Manas Pal, in his Op-Ed titled ‘A Diary Note on Mujibur Rahman’’, published in Agartala’s daily Bengal Newz of 5 November 2012, proving that India and the Sheikh had been planning the secession much earlier." You have made good points. Nonetheless my sympathies are with the good Prof. The fact that the news is drawn from (an allegedly) fake website is no guarantee that the news itself is fake. It cannot be ruled out that Kerry sb did give ModiGee a piece of his mind. Riaz Sahab please stop fooling the people of Pakistan. Neither we watch Mubashar Lucqman shows nor do we believe in such fake articles by Daily News Pakistan. I think we should concentrate on our internal problems before blaming others. Wasim:" please stop fooling the people of Pakistan"
Please stop fooling yourself. It's far worse than fooling others. Please read my post carefully and watch all the videos in their entirety with an open mind. Try and educate yourself about both internal and external sources of Pakistan's current crisis. This seems like a fruitless endeavour and illustrates why there can be no peace between India & Pakistan. As a subcontinent watcher, I know for every comment or argument one makes, there is an counter argument from the other country. Today however, Pakistan is on the losing side for two reasons. Even before the annihilation of OBL, apart from few fundamentalist Islamic states, not many countries trusted Pakistan in its involvement of fighting Terrorism. Quite the opposite, Pakistan was known to harbor many terrorist organizations with outright support from the ISI. Today some of them have turned inward and are tormenting Pakistan itself. Secondly, if you think you can propagate conspiracy theories, or any other spun off theory, on the web there are now seven more Indians ready to challenge and assert themselves for each Pakistani! You may think that with Pakistan, with its nuclear arsenal, may be on par militarily with India. However Sir, there are other PR wars that Pakistan may have already lost. NEW DELHI: India may be pounding Pakistan heavily on the border in retaliation to its continued ceasefire violations, but minister of state (MoS) for home Kiren Rijiju feels New Delhi does not need to be hawkish on Pakistan and must let go of its obsession with the neighbour. Speaking at an event in the capital, Rijiju said India should retain its image of a soft state as that is its strength. He, however, qualified his statement with the caveat that it should, however, be firm in defending itself. The minister was speaking at the second RV Raju Memorial Lecture organized by National Investigation Agency (NIA). Speaking after senior journalist Shekhar Gupta, who delivered the lecture titled 'Pakistan and Neighbourhood—A Hawkish Attitude', Rijiju said, "We are a natural soft power. We don't need to be hawkish (vis-a-vis neighbourhood). We should not tinker with our international image of being a soft power." Speaking on Pakistan, Rijiju said, "I think Indians and Pakistanis should not be obsessed with each other. If we need to be a superpower, we need to let go of our Pakistan obsession." He, however, said that "our apparatus does not need to be soft" and that India should be firm in defending itself. There you have it! India has become the perennial scapegoat for Pakistanis and yet this sickness is for the large part unproven and unheard of elsewhere in the world. It seems it is in the Pakistani interest to do so and imply and say "that is the reason we had to split from India because we could not live in a majority Hindu state"! The US and India have begun discussions on a intelligence-sharing pact that could tie the two countries’ covert services into one of the closest partnerships the superpower has outside of the “Five Eyes” Treaty signed by the five English-speaking powers after World War II, highly-placed government sources have told The Sunday Express. First raised ahead of Prime Minister Narendra Modi’s summit meeting with President Barack Obama in September, the discussions on the pact will be reviewed by the two leaders on Sunday, the sources said. The pact would enable India access to encrypted digital traffic its intelligence services are now unable to decipher. It would also make state-of-the-art western espionage technology available to the Directorate of Military Intelligence and the National Technical Research Organisation. The US has provided a growing volume of information on planned attacks by Pakistan-based groups — helping India preempt at least two attacks on diplomatic facilities in Afghanistan, the last one its consulate in Herat. However, it does not currently share the raw data or sources from which the warnings are generated — in some cases, making interpretation of information problematic. There are, sources said, several formidable challenges to be overcome before India can begin purchasing cutting-edge digital intelligence technologies from the US. For example, fearful that equipment can be used to eavesdrop on sensitive information, India insists on domestic security certification for purchases. However, no Indian firm currently certifies EAL7-plus, the most stringent standard for digital security. A former Director General of Police Punjab, a crusader against the drug-trafficker-politician nexus, observed in an interview (Outlook magazine, May 12) that a ‘sleeper cell’ of the terror groups was involved in the Pathankot attack. India’s national security establishment, while dealing with the attack, had failed to examine the role of drugs-arms trafficking and money laundering networks operating in the border areas of Punjab and Pakistan with links to terrorists. This would have called for a cooperative approach between Indian and Pakistani security and criminal justice establishments. Doval is a hawkish thinker, activist and speaker popular in the predominantly right wing middle class social circles of India. He has delineated his approach to Pakistani terrorism in his Nani Palkiwala Memorial Lecture, 2014 and the Lalit Doshi Memorial Lecture, 2015. Pakistani terrorism against India, according to him, is a tactic to achieve ideological and political advantages. So the enemy has to be engaged at three levels: defensive, defensive-offensive and offensive modes. The often resorted to ‘defensive’ mode is ineffective and irrelevant. This seemed to be crux of the Doval Doctrine. Either Pakistan give up terrorism against India as a state policy or India would let it “bleed with the Taliban”. Doval states that terrorist organizations could be bought with money, weapons and manpower. Or a “paradigm shift” should occur with the use of high technology and “intelligence-driven covert operations”. Doval used a boxing terminology and deplored the Indian tendency to punch below its weight. It must punch not below or above its weight but improve its weight to hit proportionately. Doval emphasized that “individual morality should be imposed on the larger interest of the state”. The values of the state are above the values of individual. Doval-approved covert operations were conducted by the then Army Chief General VK Singh who set the Technical Support Division and carried out several such ‘operations’ in Baluchistan, part of Pakistan, in 2015. Baluch dissident leaders were hosted in Delhi and the Baluch Liberation Organization (BLO) has existed in Delhi since 2009 (Indian Express, October 23, 2015). Aggressive actions by Doval against Pakistan included the cancellation of the Foreign Secretaries’ meet in August 18 2014 and the NSA’s in August 22 2015. Modi, on the advice of Doval, has adopted a hard line on Pakistan and has refrained from commenting on the peace efforts made by his predecessor Prime Minister Manmohan Singh in back channel diplomacy with President Musharraf and has ignored the four-point formula evolved to settle the Kashmir dispute.